The story of the Easter rabbit in American culture showcases the contingencies of how agroecology and public culture relate. Unlike Christmas trees or Thanksgiving turkeys, the middle-class American Easter lacks an iconic natural artifact that is reproduced both as symbol and as a physical good. 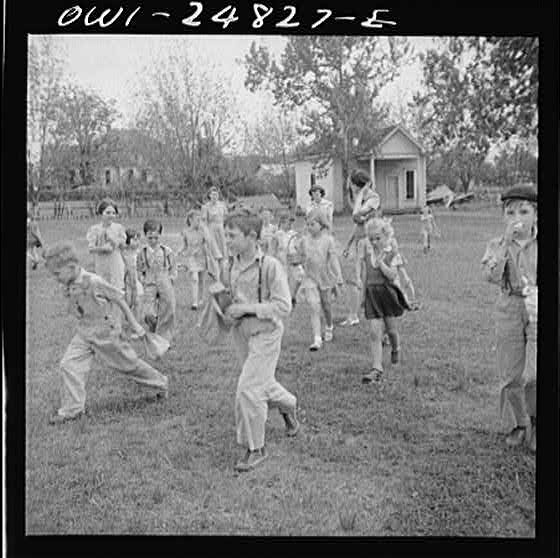 In the photograph below, taken in rural Texas during the 1940s, the children search for Easter eggs in a school lawn, the day before classes end for Easter break. While they may have been searching for boiled and dyed eggs, Americans were then purchasing more and more chocolate eggs for Easter, moving the symbolism of eggs further away from their physical referents. As it turns out, Easter in America has an even deeper history of missed connections between meanings and materialities. The Easter Rabbit, the subject of this chapter, came to the United States in the early nineteenth century, beginning a winding path through America’s farms and parlors. Although often assumed to be a straightforward import from German folklore, the Easter Rabbit made its entry into American Victorian culture through the children’s stories of Christoph von Schmid. A Catholic priest in Bavaria, his stories (and their English translations) reached for a broader, nondenominational Christian audience, one cohered around domestic ideals. His story “The Easter Eggs,” published in a variety of American outlets in the 1830s and forward, used a picturesque mountain village as the setting for the birth of the Easter Rabbit. When Rosalind, a woman of nobility, takes refuge in the village, she brings with her the gift of poultry, as well as customs to go with these new, strange birds. Out of the interaction with villagers comes the Easter Rabbit, a product of miscommunication. But the interaction is also about class, virtues, and the place of nature in Victorian domestic culture. Schmid’s story, therefore, is a chance for the chapter to explore these themes in nineteenth-century America. By the late nineteenth-century, Schmid’s authorship receded into the past and many took his story simply as the product of German folklore thriving in the United States. While the narrative could sink into American middle-class culture, its values held surprisingly little sway in how Americans of that class actually treated rabbits. They could read Easter Rabbit tales to their children that elevated kindness and generosity, while also waging war on actual rabbits. Indeed, the nineteenth-century witnessed perhaps hundreds of rabbit round-ups, each resulting in the death of thousands of these animals. A nuisance to orchards and pastures alike, farmers wasted little time eradicating these pests (as best as they could). On the Great Plains and the Middle West, farmers and townspeople would gather in the early mornings of winter, form a line miles wide, and walk toward a corral. As they approached, they narrowed the line, constricting the rabbits’ path and flushing them into what would be their last pasture. Inside the corral, gunshots would have recklessly endangered the people gathered, so the rabbits were killed with clubs, beer bottles, and pipes. All this, by people all the while considered polite. Bystanders even sold lemonade to women and children decked out in their Sunday best. This striking difference between the treatment of fictive and physical rabbits serves as a fitting introduction, underscoring that agriculture and popular culture do not necessarily travel along the same path toward the production and consumption of just any good. The story of the Easter Rabbit in America, therefore, is a story of contingencies and missed opportunities.